Due to the twisted nature of the mind of the sadist architect for built my house, my room is the hottest part of the whole structure. I have no idea why but it’s for this reason that I’ve spent the last ten minutes wondering around with my laptop trying to find a place that’s cool enough to sit and type in. Unfortunately, the best rating I’ve given to any room is tolerable and that’s the kitchen table but only without a shirt. Fortunately, no one is home to be blinded by my fleshy pale exterior. So, I finally sit down to type out this little blog update and I find I have an e-mail from my bank about some “irregular activity” on my bank account. Turns out they always raise an eyebrow when people make random purchases from quasi-shady Canadian Third Party video game equipment distributors. Who knew? This summer has been absolutely lovely. The fact that my creative juices have been flowing so freely and I get at least five hours of free time a day totally makes up for the lack of A/C in this house. I’ve been working on a new project. It’s currant title is “Into Summer.” It’s a computer game love story about time travel. I’m hoping to use it as an exploration of mood and atmosphere but in a way that isn’t eyeball melting-ly boring the way all other games that are made with those goals in mind seem to be. Also, anyone who’s truly savvy will have noticed that the title is an reference to an old 1950’s sci-fi book called The Door Into Summer also about time travel, but very different to this project. I’ve written some lengthy prose concerning the two main characters and their situation but I’m extremely hesitant to upload it to this blog or even deviant art. I’d rather keep them private, however proud of them I am. Also, I haven’t forgotten my old project, the REALLY big one called “Eyes On Trial".” It’s really big and honestly the sort of thing that’s totally out of my league for the moment in terms of plausibility. But, it remains, in the background and eventually I will take it and I will organize it and streamline it and probably subtract some things in order to fully expand on the key elements. Blah blah blah, game designer talk. I feel bad writing so much but not adding a photo. 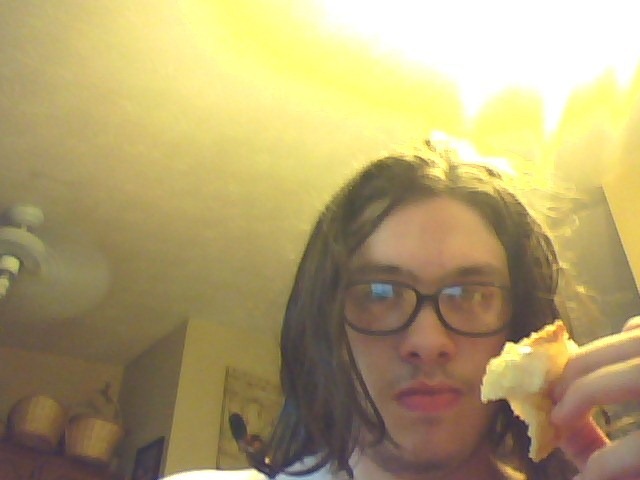 Oh hell, here’s a picture of me without a shirt eating a croissant with crème fraîche. Sure. Keep checking back here though, I’m most likely going to continue posting about it here, although I might just start a whole new blog just for it. I think your site was so great and it is really awesome..Of course it really impress me a lot..
Good job dude and i hope you can keep it up..
Good blog post. I definitely appreciate this website.